From the cotton in our clothing to our daily coffee and cuisine, seeds are everywhere in modern society. As a graduate student, Thor Hanson explored the biology of seeds: their dispersal, germination, and physiology. But years later, when his own sprout Noah took an interest in seeds, Hanson began to realize what an evolutionary wonder they truly are. The Triumph of Seeds is a lively microhistory that explains the social and cultural connections we share with the humble seed. Hanson explains the intricate and mesmerizing biology of the seed, which can wait for centuries for the right conditions to sprout. Described as a “baby in a box with its lunch,” seeds are equipped with their own food supply, protection, and energy potential to become adult flora. This potential is exemplified in a 2,000 year old date seed that when planted in 2005, grew into a 9 foot tall palm. 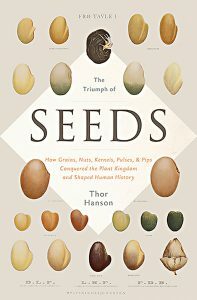 Hanson also explores how seeds have shaped our own evolution, from aviation design to improving our diet, and consequently our own physiology. Hanson postulates that the human skull changed about 4 million years ago in response to diet centered on hard-shelled seeds. In addition to scientific information, Hanson shares his own seed history, with humorous anecdotes such as attempting to crack a seemingly impenetrable nut. Hanson describes the details behind seeds’ success in an accessible and colorful way. 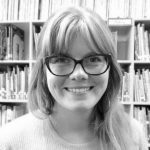 If you like the works of Mary Roach and other microhistorians, you’ll enjoy this fun read.